The LADY HAWKE 33 CATAMARAN is the ideal choice for those who want to experience the sea in safety and style without sacrificing comfort and With its captivating lines, the design is 100% Made in Italy from its beautifully detailed interiors to only the highest quality materials used. 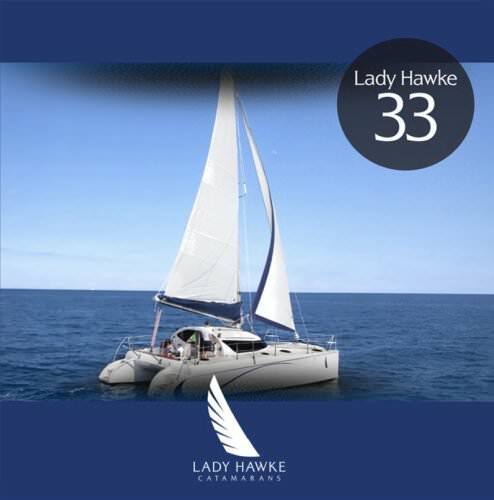 The Lady Hawke 33 presents itself as a unique product suited to a discerning audience looking for the perfect balance between elegance and sporting performance. Technical Information Water tanks Diesel engines Erik Lerouge Sailing close howled or close reach, the boat achieves excellent performance, but to obtain maximum speed a code zero is recommended. In a beam reach and even more so in a broad reach, the Lady Hawke 33 easily achieves double-digit speeds of over 17 knots. Additionally the engines offers smooth manageability whilst effortlessly reaching an enjoyable cruising speed. Lady Hawke provides you with the option to request either the 3 cabin version that has 2 large aft cabins and a comfortable cabin in the bow, or the charter version with two heads in the bow and two cabins in the aft. Everything inside the Lady Hawke 33 has been designed to maximize comfort and functionality, leaving the sailor free to enjoy pure and simple sailing pleasure.